Trinidad is a place where we think buildings, roads and bling are a sign of progress. We have no other markers for how we consider our quality of life. Tobagonians seem to want to head in that direction, and I hope they pull up themselves and re-consider their values.Currently Wayne Kublalsingh is on a hunger strike. And all over the internet you're hearing that he striking for a highway. There are many who are saying in posts laden with sarcasm that he killing himself over a highway. There are folks who have already posted that he should dead, because they see Wayne's action as opposing the Government; and in Trinidad once you oppose a government, its supporters always want you to die...or at least lose your job. The issue that I believe is central to Wayne's protest and that is being roundly ignored as the People's Partnership rally the circling wagons to protect themselves is quality of life. 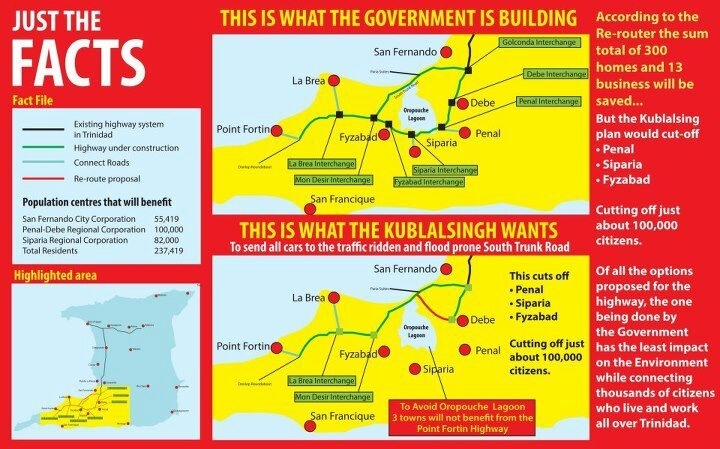 This protest has never been about stopping the building of a highway; it has been about shifting a portion of the highway so that it does not interfere with the quality of life of a village. But many think it makes more sense for the village to move than for the highway to change course. The right to keep their homes and lands in tact. Homes and lands that have been in families for generations. The right to keep their close knit communities in tact. The right to live in communities in which they feel safe, have wide open green spaces, and the quality of life they cannot find in urban or semi-urban spaces. The right to continue with their livelihoods that require these wide open green spaces. There are several other issues too: the environmental impact, the impact the re-route will have on an archaeological site at Banwarie Trace in San Francique village and of course, according to the Re-Route Movement, the shift they are suggesting will save the Government hundreds of millions of dollars. Of course in the most recently circulated information on FB, masquerading as just facts, the fact givers aren't talking about the environmental impact on the Oropuche lagoon, a crucial part of the drainage systems in the Debe-Penal-Siparia area. Their entire argument boils down to skewering numbers and cleverly positioning the names of certain villages prominently; while asking what's wrong with inconveniencing 300 homes and 13 businesses, when we can build a highways that will benefit hundreds of thousands? And maybe they are right. What exactly is wrong with uprooting the way of life of a couple hundred people? Why ask hundreds of thousands to endure a re-route that only going to change the lives of a couple hundred? In response the government has offered compensation, which the villagers have stoutly refused. 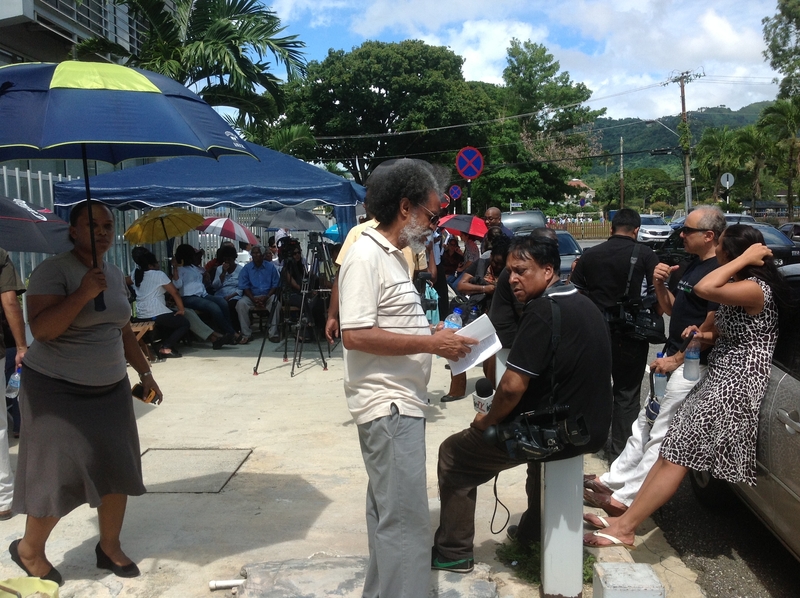 They have also offered them the opportunity to re-purchase 1-lot plots in the village of Petit Morne. From homesteads on acres of land to 1 lot of land. From having an already established home that generations have lived in to having to re-build and probably attain a mortgage at this stage in life. And some of the residents are in their 50s and 60s, so what kind of mortgages can they really access if they had to? In listening to the Re-Route issue I had to stop and ask myself how do we really consider quality of life here. Is it only in terms of highways and buildings? Gas revenue that never trickles down to us? Jobs given to us for political loyalty and patronage? Fighting to protect a way of life isn't worthy of a hunger strike? Ok, then what about this...six months ago the Prime Minister, our head of government, a woman who rode into government on a massive mandate gave the re-Route Movement the assurance that she would meet with them and consider the changes to the highway route they were suggesting....she has since then reneged on her promise. Is holding our leaders accountable worthy of a protest or a hunger strike? So what's going to happen when this government runs roughshod over another community and breaks their promises to them (eyes on you East Port of Spain)...we going to turn a blind eye and pretend this isn't our problem and it's not our job to hold the government accountable? If it isn't our job, then whose is it?